The next Administration should prioritize increasing access to health care, especially for minorities and under-served communities, according to experts assembled on Tuesday for a discussion on health disparities and innovation. The discussion before an audience of 150 at the Newseum in Washington D.C. was presented by The Hill and sponsored by the USC Leonard D. Schaeffer Center for Health Policy & Economics. It sought to find common ground between the twin objectives of enhancing access and encouraging innovative treatments. 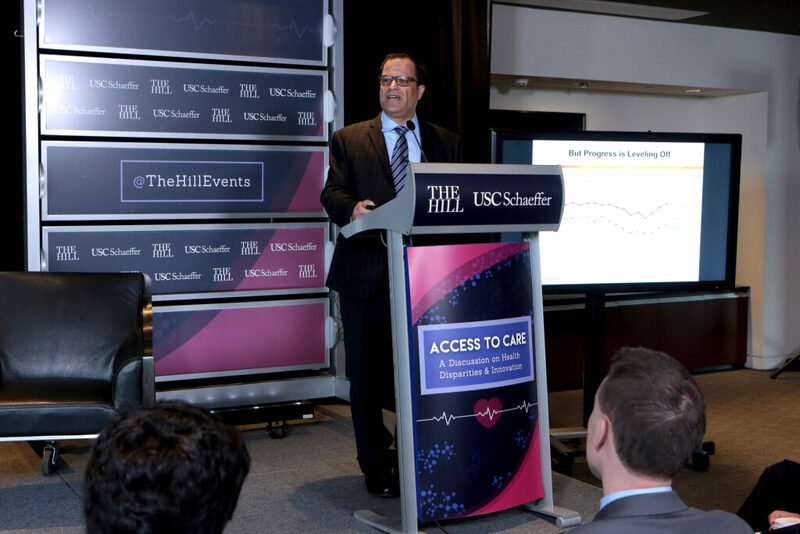 Dana Goldman, director at the Schaeffer Center, argued that new treatments for heart failure are a good example of how innovation can lengthen lives and narrow disparities. He noted that an estimated 5.7 million American adults suffer from congestive heart failure, which is a contributing factor in one in 9 U.S. deaths. The disease has an outsized impact on minorities. About 1 in 4 black women aged 45 to 75 is at risk for heart failure, compared to 1 in 7 white women. All women need to be aware of the risk, said Mary McGowan, CEO of WomenHeart, the National Coalition of Women with Heart Disease. She noted that one in five women with heart disease are misdiagnosed at emergency rooms. Some effective new treatments are now available, Goldman said, but unless they become more widely adopted the heart failure rate is predicted to double by 2030. He ticked off a litany of prior failures to improve access and health outcomes in minority communities, including diversifying workforces and improving cultural competencies. Raju said he has concluded that major progress won’t be made until overhanging social and economic conditions improve. “It doesn’t help the patient if he gets treated for diabetes but gets shot outside the hospital,” he said. Samantha Artiga, director of the Disparities Policy Project at the Kaiser Family Foundation, said the South runs the risk of falling further behind in health outcomes because so many states in the region declined to expand Medicaid enrollment under the ACA. African Americans are twice as likely as whites to fall into the resulting coverage gap between Medicaid and subsidized ACA insurance plans, she said. Mark Hlatky, professor of Health Research and Policy at Stanford, said new drugs can help cut into disparities, “but just having the drug out there doesn’t mean it gets taken.” The health system is fragmented and incentives at one level may not align with incentives at another. Contrasting views of the impact of the Affordable Care Act were presented by J. Nadine Gracia, director of the Office of Minority Health at the Dept. 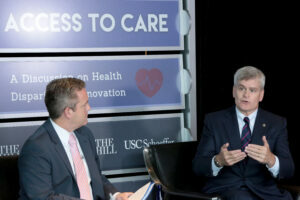 of Health and Human Services, and Sen. Bill Cassidy (R-LA). Gracia lauded the Act for driving the uninsured rate below 9 percent, including marked gains among minorities, and for making preventative services available to millions at no cost. 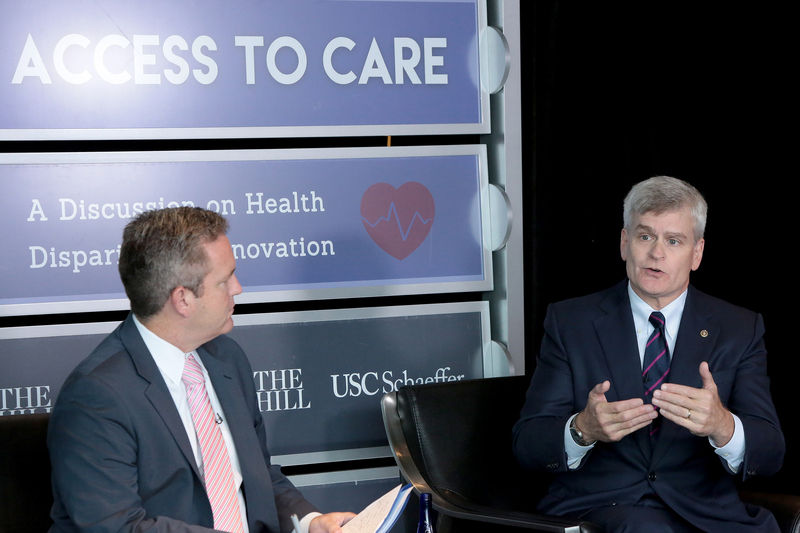 The Hill’s Bob Cusack interviews Sen. Bill Cassidy, M.D., (R-La.). Cassidy, who is the co-author of a new bill that seeks to repeal all the ACA mandates and replace subsidies with a tax credit, said the ACA was failing because it is not affordable. “When poor people run up against a $6,000 deductible, it may as well be $6 million,” he said.